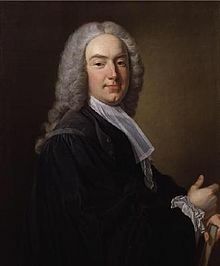 William Murray, 1st Earl of Mansfield, SL, PC (2 March 1705 – 20 March 1793), better known as Lord Mansfield, was a British barrister, politician and judge noted for his reform of English law. He served as a Member of Parliament for Boroughbridge, where he was noted for his "great powers of eloquence" and described as "beyond comparison the best speaker" in the House of Commons. He thereafter became Attorney General, and then Lord Chief Justice of England. An estimated value is a precarious measure of justice, compared with the specific thing. Fisher v. Prince (1762), 3 Burr. Part IV. 1365. Anciently, the Courts of justice did sit on Sundays. Swann v. Broome (1764), 3 Burr. Part IV., p. 1597. The last end that can happen to any man, never comes too soon, if he falls in support of the law and liberty of his country: for liberty is synonymous to law and government. Rex v. Wilkes (1769), 4 Burr. Part IV., p. 2563. As mathematical and absolute certainty is seldom to be attained in human affairs, reason and public utility require that judges and all mankind in forming their opinions of the truth of facts should be regulated by the superior number of the probabilities on the one side or the other whether the amount of these probabilities be expressed in words and arguments or by figures and numbers. Reported in Andrew Stuart, Letters to the Right Honorable Lord Mansfield (1773), p. 29. Jones v. Randall (1774), Lofft. 386. A man wants no protection when his conduct is strictly right. Bird v. Gunston (1785), 3 Doug. 275. Tut, man, decide promptly, but never give any reasons for your decisions. Your decisions may be right, but your reasons are sure to be wrong. When asked by an army officer, appointed governor of a west Indies island and who had no experience in law, how to apply the law. Quoted by John Cordy Jeaffreson in A Book About Lawyers, Volume 1 (1867). I see through your whole life, one uniform plan to enlarge the power of the crown, at the expense of the liberty of the subject. To this object, your thoughts, words and actions have been constantly directed. In contempt or ignorance of the common law of England, you have made it your study to introduce into the court, where you preside, maxims of jurisprudence unknown to Englishmen. The Roman code, the law of nations, and the opinion of foreign civilians, are your perpetual theme;—but whoever heard you mention Magna Charta or the Bill of Rights with approbation or respect? By such treacherous arts, the noble simplicity and free spirit of our Saxon laws were first corrupted. The Norman conquest was not compleat, until Norman lawyers had introduced their laws, and reduced slavery to a system.—This one leading principle directs your interpretation of the laws, and accounts for your treatment of juries.